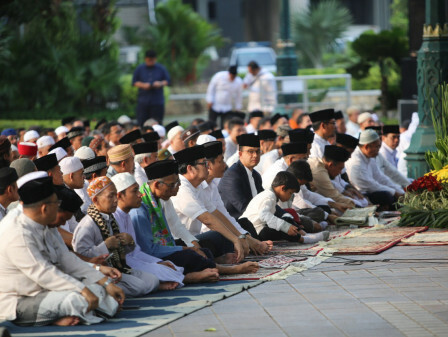 Jakarta Governor, Anies Baswedan together with his wife, Fery Farhati and his children, Mutiara Annisa, Ismail Hakim, and Kaisar Hakam conducted Eid al-Adha prayers at City Hall yard.
" Eid Mubarak for all"
According to beritajakarta.id observation on the field, Eid al-Adha prayers were also attended by Jakarta DPRD Deputy Head, Mohamad Taufik; Jakarta Secretary, Saefullah; several SKPD heads and hundreds of local residents. Ustad Ahmad Fauzi Halim as imam for the Eid al-Adha prayer started it around 6.40 AM. While Ustad Fahmi Salim Zubair acted as khatib delivered sermon with theme "Spirit of Sacrifice to Make Jakartans Happy and Its City Advanced". After prayer, Anies conveyed that he learns about obedience and social piety. "Eid Mubarak for all," he expresses, Wednesday (8/22). He explained, totally there were 94 cows and 224 goats collected from all government in five Jakarta regions. "Technically, sacrificial animal's meat distribution is done by local government," he explained. In that chance, he symbolically gave one cow with around 1.2 tons weight to be sacrified. Meanwhile, Qurban Commitee in Jakarta Provincial Government which also acts as Jakarta Korpri Board Secretary, Amirudin said his side has received 14 cows and 3 goats to be sacrificed from Jakarta Government and BUMD officials. His side directly handed over two cows and three goats to local residents through religious and social institutions. While the remaining 12 cows will be slaughtered in Dharma Jaya slaughterhouse in Penggilingan, Cakung, East Jakarta. "Sacrificial animal's meat will be distributed to mustahiq and Other Individual Service Providers (PJLP) in City Hall and Technical Dept.," he stated.